That old adage “East is East, and West is West, and never the twain shall meet,” is hogwash. The more I nose around and see new things, the more echoes and possible connections turn up. First it was the early modelbooks, mostly German and Italian of the early 1500s, some of which appear to have copied textiles or ornament from further south and east. In TNCM, I pointed out that some designs in Schonsperger’s 1526 Ein Neu Modelbuch were possible transcriptions of Islamic Kufic script, often used in woven and stitched Tiraz bands (TNCM 18:2). A knit cushion from the tomb of Fernando de la Cerda of Castile (d. 1275) is another example of similar script (Richard Rutt, History of Hand Knitting,1987, p. 41, and TNCM 18:4). The Islamic link in elaborate stepped double running stitch embroidery – the precursor to European blackwork strapwork styles – is now well documented. The talented Mathilde Eisenbach presents a summary and samples of Medieval Egyptian counted work (among others). But it didn’t start there. 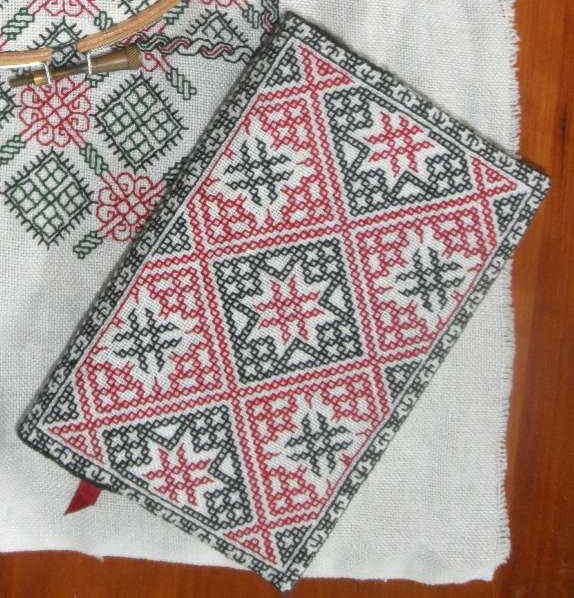 Double running stitch done in steps and little squares may well have its origins further east, and European style blackwork most definitely has an Indian cousin, with its own long and murky history. It’s pretty obvious that double running stitch is one of the simplest of all embroidery stitches. It can be used both on the count and “free” to produce linear designs of all types, with the advantage of producing double-sided work. Most of the strapwork and counted styles I favor lean upon it heavily, either alone, or in combo with other stitches. I’ve often noted its persistence through time and across distance. It’s so common a stitch that it’s extremely difficult to say its use in one locale or culture predates another, but it’s so tempting to find parallels and relationships among its various incarnations. First, time out for megathanks to new knitting/stitching penpal Jayashree Madan Gopal, who took the time to get me started on this path. Meet Kasuthi (Kasuti, Kashida), an embroidery style now practiced as a traditional art in Karnataka, India. This style is not very well known in the West, with the phrase “Indian embroidery” more often invoking thoughts of shisha mirror work, tambour chain stitch, or shadow work. But it should be better known, especially among those interested in the historical roots and cousins of European Medieval and Renaissance stitching. Kasuthi embroidery is a style that many sources claim dates back to Persian influences in the 7th century, which found a home in the northern Karnataka region. According to Jayashree’s research, it spread during the Chalukya period, and was considered one of the fine arts of accomplishment (the 64 Kalas). Kasuthi embroidery, also called Karnatak Kashida, is still practiced widely today, traditionally worked on bridal saris, cholis (sari blouses) given to expectant mothers, and in contemporary works – shawls, bedspreads, cushion covers and other decorative textiles and wearables. Many of the designs used in Kasuthi have become traditional motifs – recognizable icons with commonly accepted names linked to flowers, birds, animals, architecture (temples) and devotional items. In a research paper shared by Jayashree, she and Anita Choudapurkar outline some early history of Kasuthi. Their findings are abstracted below. Karnataka is an area on the west side of India, inland from the Goa region, and north of Mysore and Bangalore. The region famous for the stitching is closer to Goa than Bangalore. Persian influences were strong in this area’s Chalukyan empire, in the 7th century. Jayashree/Anita’s paper discusses the transmutation of these influences into the Kasuthi style, incorporating elements of ritual architecture, religious symbolism and ornament, and the style’s codification into a cherished folk tradition. Like many traditional styles of ornament, Kasuthi motifs are conservatively interpreted over time, and “collectable,” in that they are recognizable, and often bear specific names and associations. An excellent collection of motifs is presented in the book Karnataki Kashida by Anita Chawadapurkar (yes, the same person who co-authored the paper above, spellings of transliterated names often vary), and Menaka Prakashan. The only drawback of this magnificent little volume is that it is written in Marathi. I hope to find someone to read and translate parts of it for me, soon. For the record, I bought my copy at a local Crosswords, which is Pune’s shopping mall bookstore, similar to a B. Dalton, or Barnes & Noble in the US and didn’t order from the hyperlinked site, above. Now, how does this style link in with Western blackwork? If I had to posit, I’d say that the northern Persian origin is highly plausible. A good many things spread through the same area during the rough time window cited by Jayashree’s paper: stirrups, and chess are two examples of this cultural and technological “bundle.” I would not be surprised to find that the Ur-ancestor of Kasuthi was part of that migration. Aside: I stitched this while I was on my first trip to India. As I worked in the hotel lobby waiting for my car, two people asked me if I had taken a class in Kasuthi work, and whether I was in India to study it, since I was so obviously working on some. From the eastern Mediterranean across North Africa, and up trade routes to the wreckage of Byzantium, across the Aegean – these are also established vectors of trade and cultural dissemination. I would not be surprised to find double running stitch traditions further east on the Silk Road, too. After wandering the world paralleling conquest, trade, and the Islamic expansion, double running stitch hitchhiked into Britain, where it undoubtedly was already known. But it was “rebranded” as Spanish Stitch or Spanish Work – popularized through association with the Spanish princess and first bride of Henry VIII, Katherine of Aragon. We often know it under the name Holbein Stitch, named after the court painter who depicted it with exact detail on so many portraits. Thanks, Kim. I saw a post about kasuthi work on Stitchin Fingers and made a mental connection to double-running / Holbein stitch. It’s nice to have my idle speculation confirmed by someone who knows what she’s writing about!